Often, the letters are artfully overlapped or even hand-drawn, making it harder to read them. 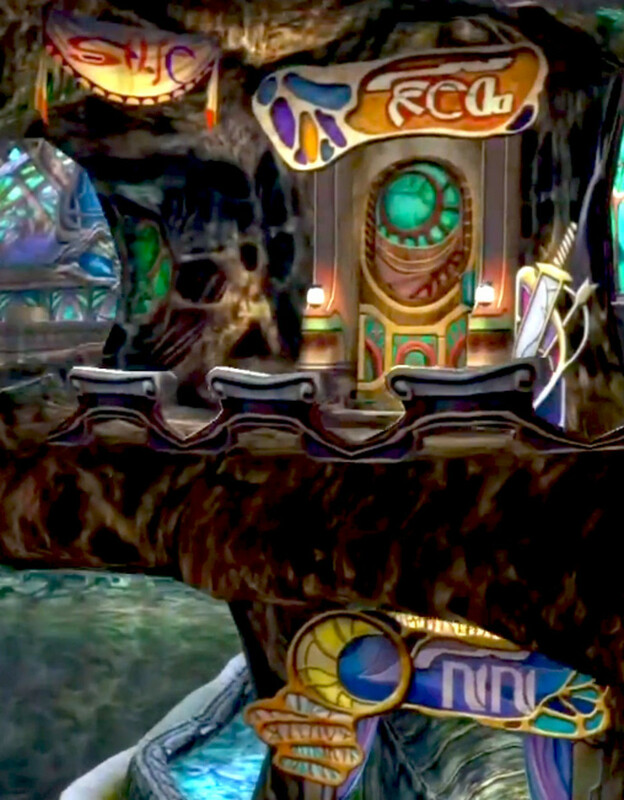 Throughout the game of Final Fantasy X, there are inscriptions, glyphs, and graffiti. They add to the texture and realism of the backgrounds. 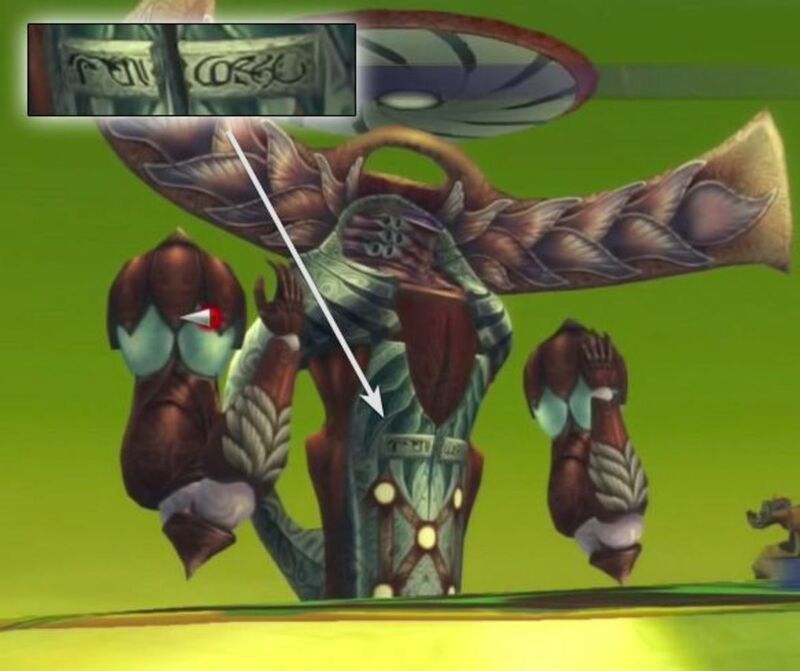 Sometimes, they reveal hidden details about the game's characters, cultures and history. 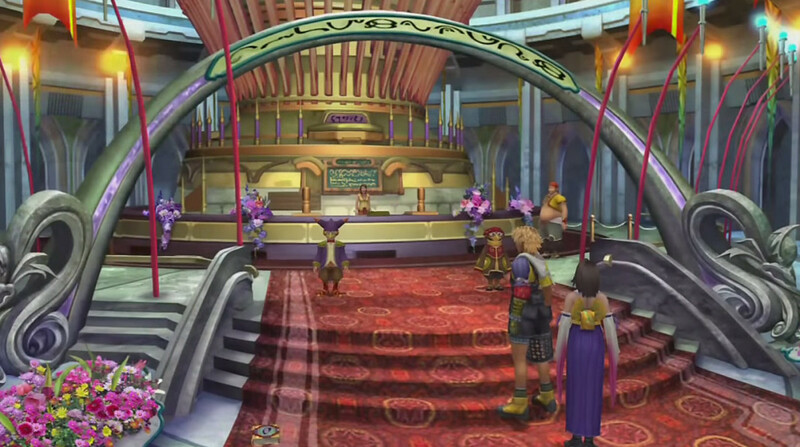 There are three different alphabets in Spira used in different contexts, plus magical symbols used for summoning. So I've divided this tour into four parts: Spiran Script (this page), Al Bhed writing, Yevon Script, and summoning mandalas. You can download fan-made fonts of the three alphabets here. 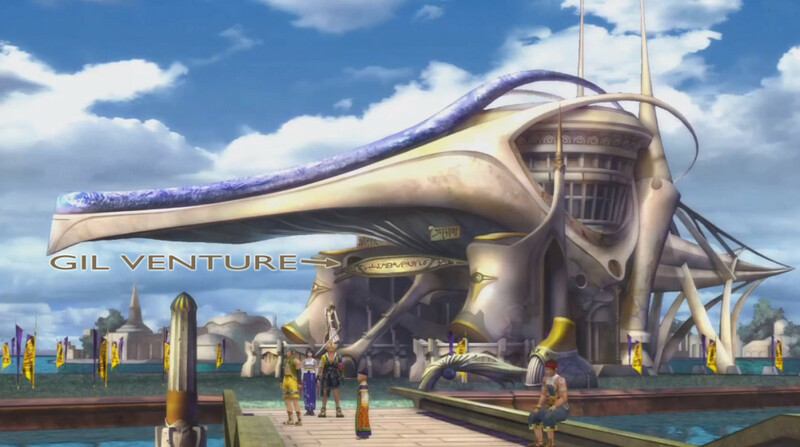 Right: the Final Fantasy X/X-2 Remaster added a "Loading" screen with lettering in everyday Spiran script. Many thanks: Screengrabs from dansg08's and DavetheUsher's great commentary playthroughs. 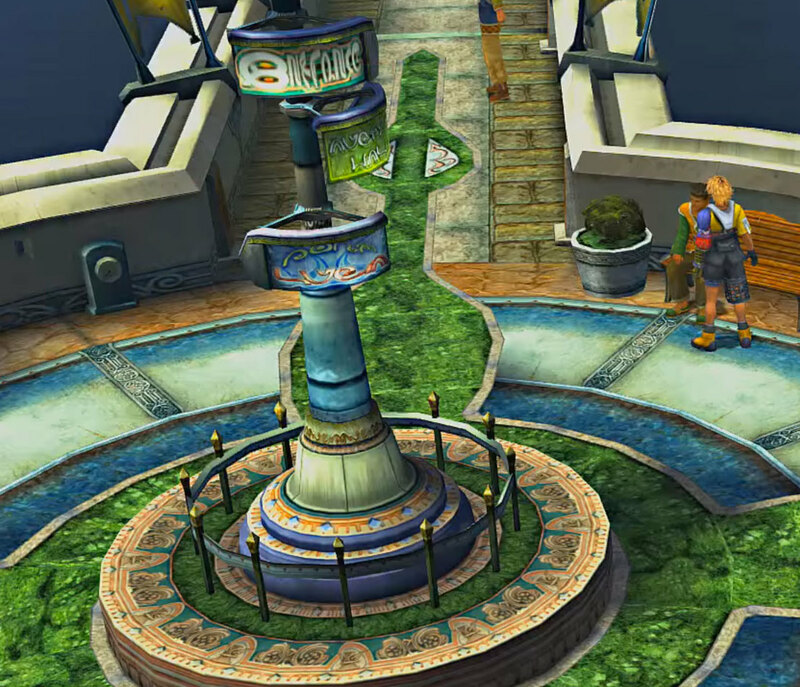 Okay, let's follow in Tidus' footsteps and uncover the signs and writing he passed along the way. First up, Baaj Temple. "Fire" on ground floor (left) and balcony (right). Balcony also has fuzzy "salam" in background. 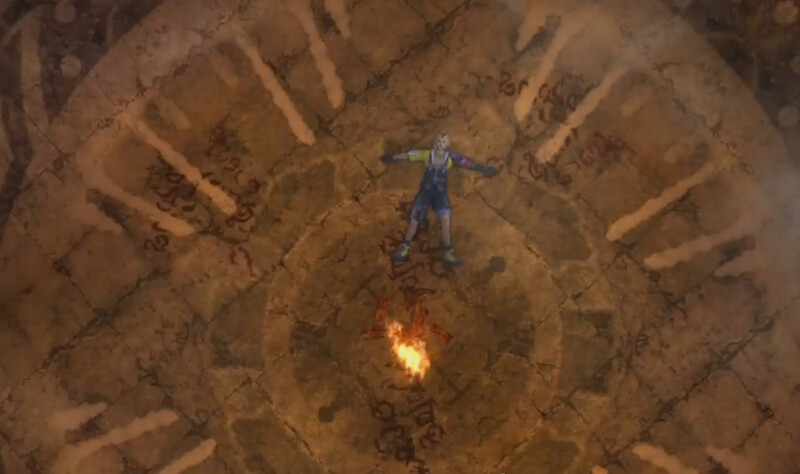 The floor of Baaj has "salam jyscal guado" scrawled around the perimeter, and Tidus is lying across "guadosalam." This is where Seymour and his mother were exiled from Guadosalam by Seymour's father, Jyscal. Did Seymour write these in anger or longing? Or did his mother? commenter rodrigo_vda helped me with a dim inscription on the upper floor. Click the thumbnail above to view. I've adjusted the Exposure on it and most of the screengrabs on this page to bring out details. Besaid Crusaders Flag - "Wisdom / Bravery"
Not sure about the "P.S." part, but maybe these poor schlubs should pay a little more attention to the "Wisdom" part of their motto. Just to be confusing, the central design is flipped in the lodge: a common problem with textures. Also, there's some gold lettering around it that I can't quite make out. 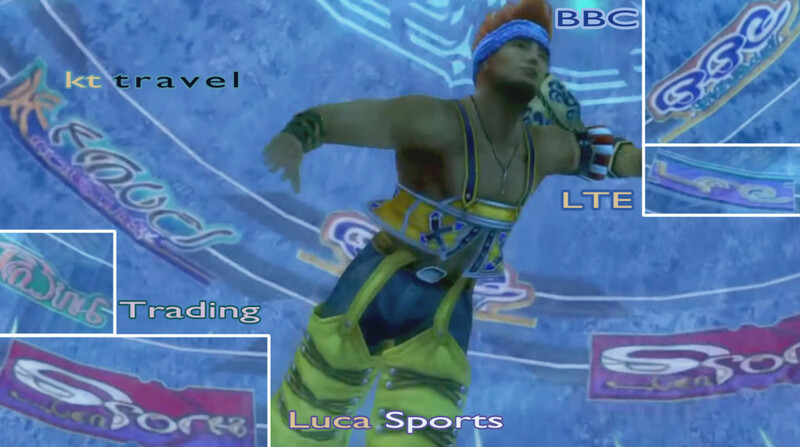 The Spiran teams' logos show up on locker room signs, balloons, and banners all over Luca. It looks like there are two teams that failed to make it into the game's playable teams! I bet the Nomads are from the Crusader camp on the north side of the Calm Lands, where Lady Yocun once trained. 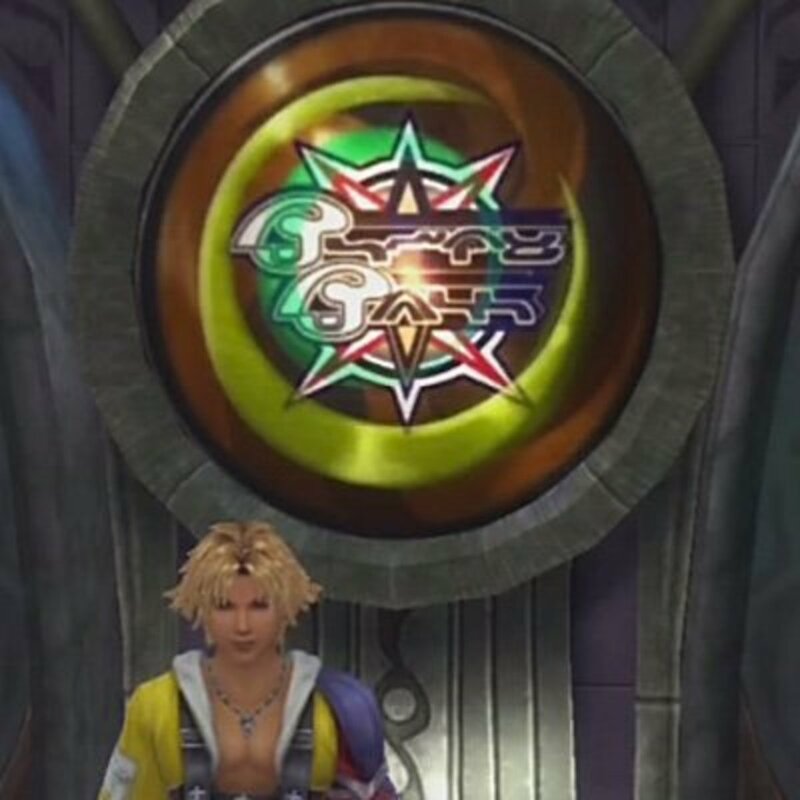 The Duggle players have their logo on the back of their uniforms: you can see it clearly on the woman whom Tidus punts out of the sphere pool in the opening sequence. *No, I can't read the teeny tiny white-on-black letters at the top of this design. It only appears now and then. 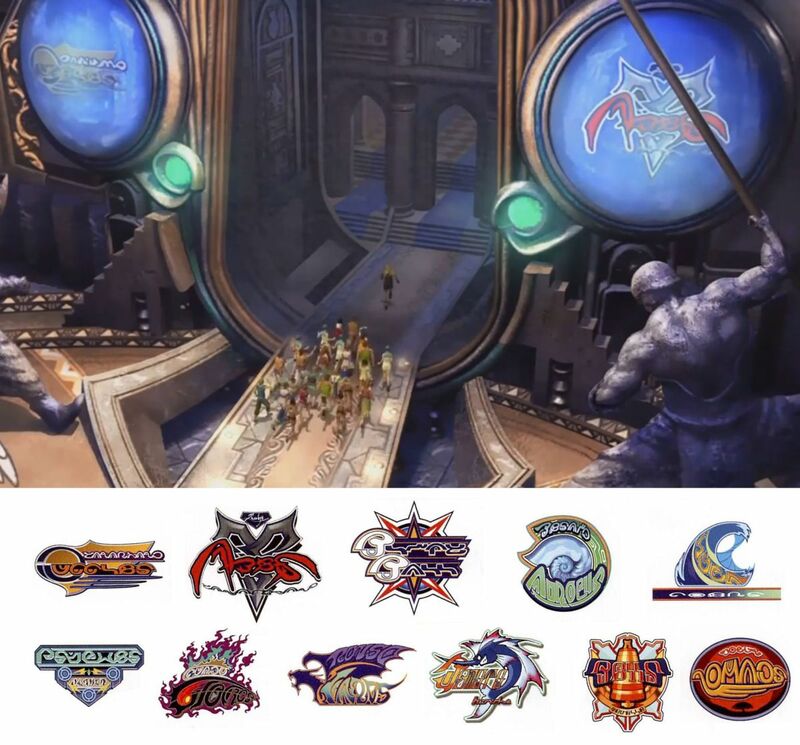 In the "bet no one will notice" department, check out team logos in the Aurochs' locker room. 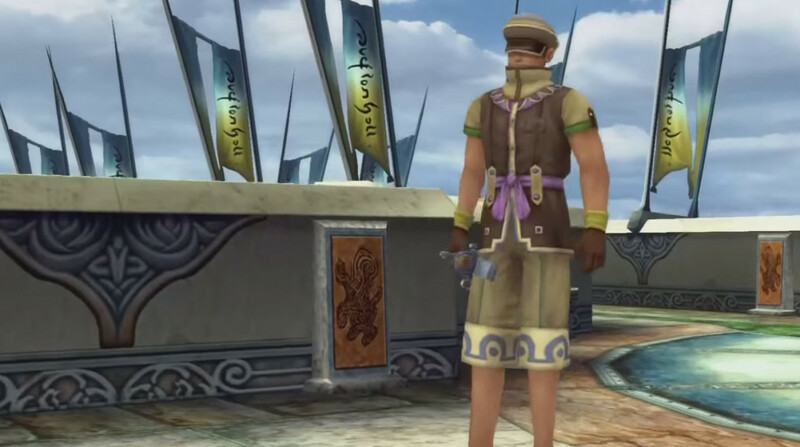 Wakka, you meanie, you pretended you'd never heard of the Abes! 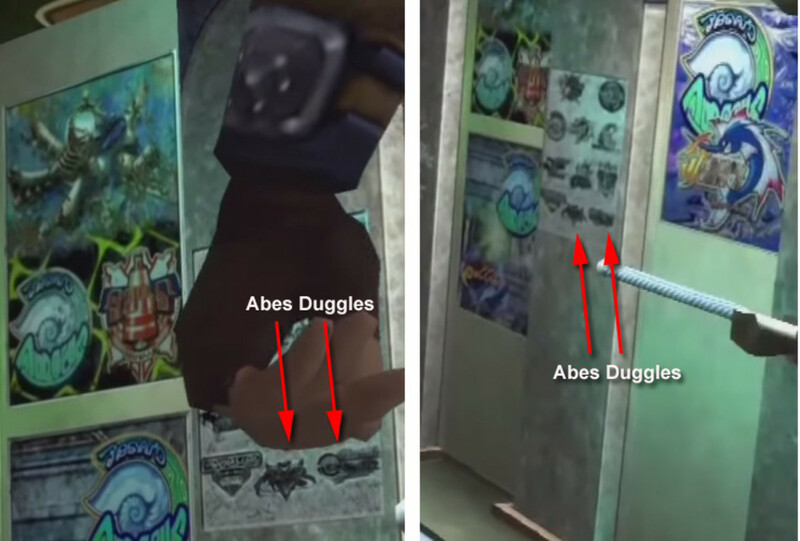 There's posters all around the room showing the Aurochs team logo vs. one other team, presumably from past matches. That left-hand screencap suggests that the Bevelle Bells were an opponent not all that long ago. To the dreams of my childhood... Farewell. 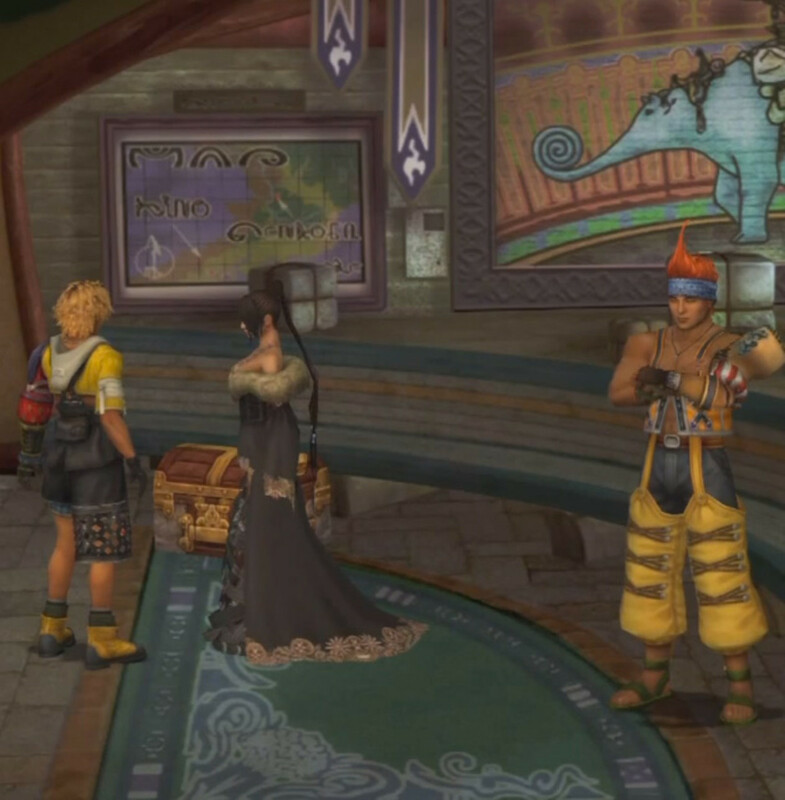 During the final match of the Luca tournament, Wakka sits out the first half in the locker room, waiting anxiously with Lulu. 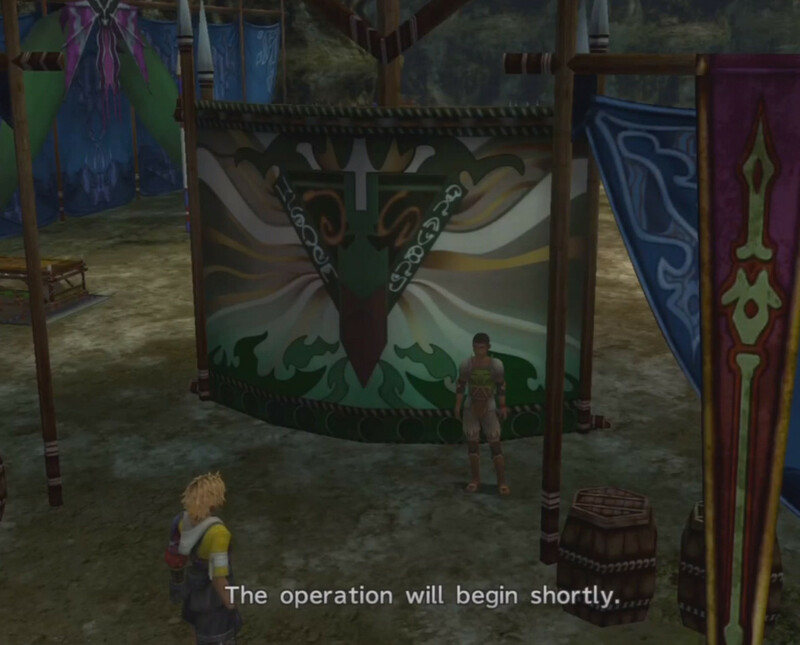 As the tournament starts, the scene switches to both of them gazing at a chalk inscription. The subtitles say, "My best memories are here." But that is an English translation of the Japanese subtitles, which were in turn a translation of the English written on the wall in Spiran Script. Confused? 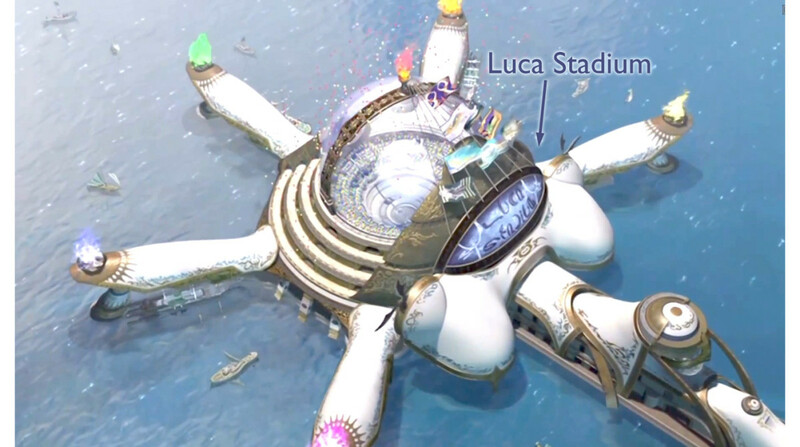 There's a ton of writing around Luca, including numerous hints that the Sphere Theater underwent design changes too late to re-render it. 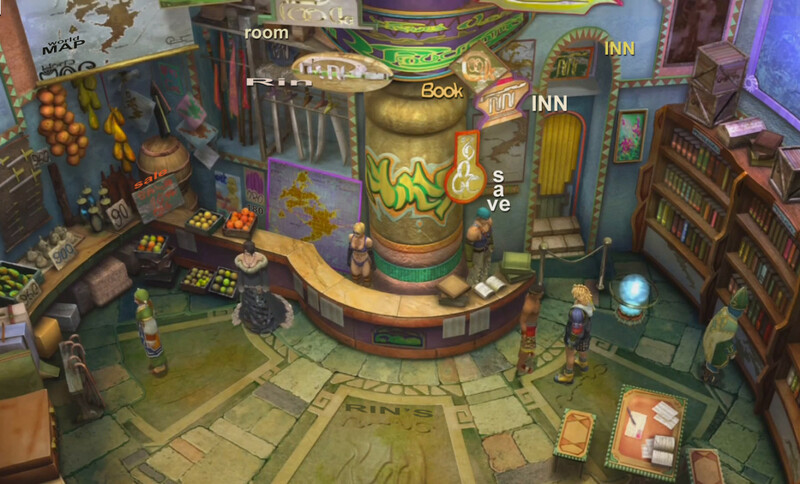 I think it was originally an auction house like those in Final Fantasy VI and IX. Kiosk outside Luca Stadium's main entrance. Of COURSE there would be a weapons shop right outside a public venue. What security problems? "LUCA STADIUM" in dark letters on that big blue canopy that's clearly visible from most of the city on the mainland. No corporate sponsor getting naming rights for the stadium? Must be a fantasy world. The five docks circle the stadium clockwise from the stadium entrance. Look down to see where you are. The pavement here says "DOCK 5 LUCA." Less obvious, although it would be clear to seasick passengers exiting the ferries, is the dark "ENTRANCE >" sign overhead. Also, there's "LUCA" banners hanging all the way around the stadium. 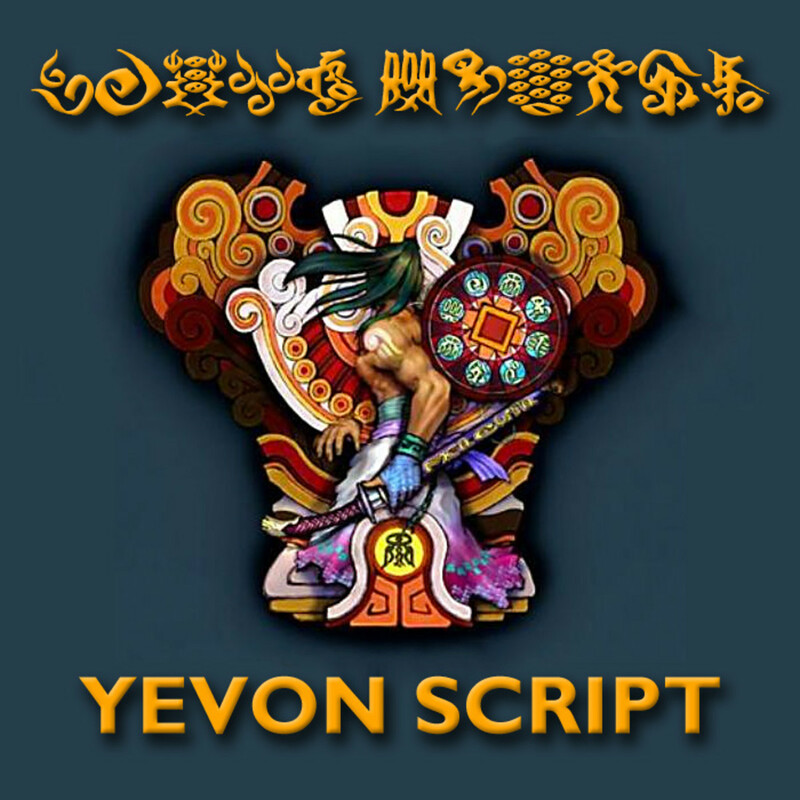 Notice the Yevon symbol. 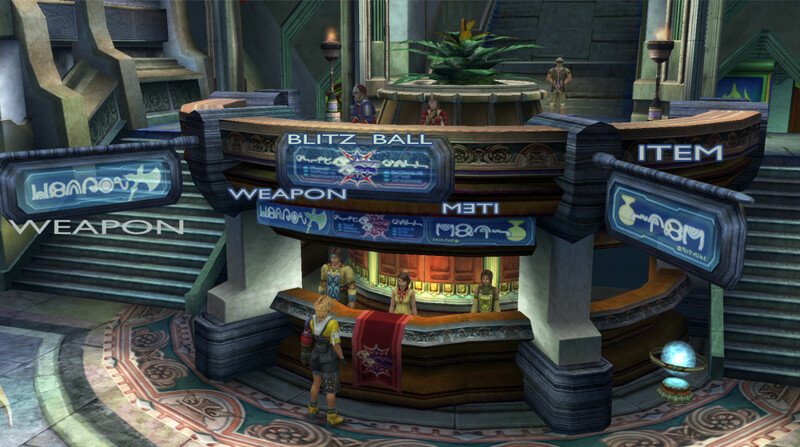 Blitzball is sponsored by Yevon, to keep the people entertained and docil. There's also a certain amount of geopolitical tension between Luca and Bevelle, an underlying sub-plot of the game that's easy to miss. Halfway across the Luca causeway, this handy signpost points you back to "PORT LUCA", towards the "Entrance" (to Luca town, I suppose), and off towards the "AUCTION HALL." But I suppose there wasn't much justification for Yuna and friends to keep turning aside from their pilgrimage to bid for luxury items in Luca. 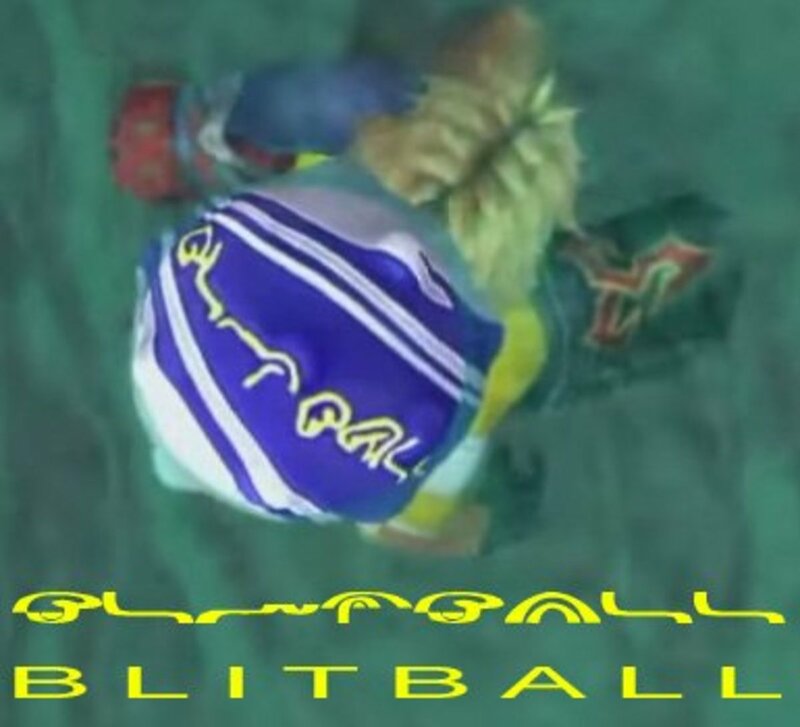 (It was difficult enough to justify keeping blitzball going, but at least there it was an integral part of the story). Oh, speaking of corporate sponsorship, there's ads in the blitzball pool. Rumor has it there's an NHK ad as well; haven't found it yet. (I can't read the tiny text under BBC; maybe "news service"). 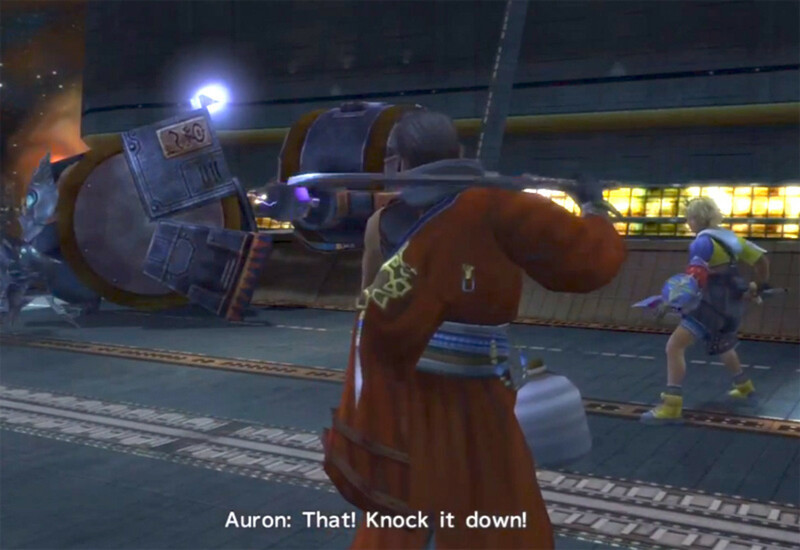 "Someone saw Sir Auron in a cafe!" 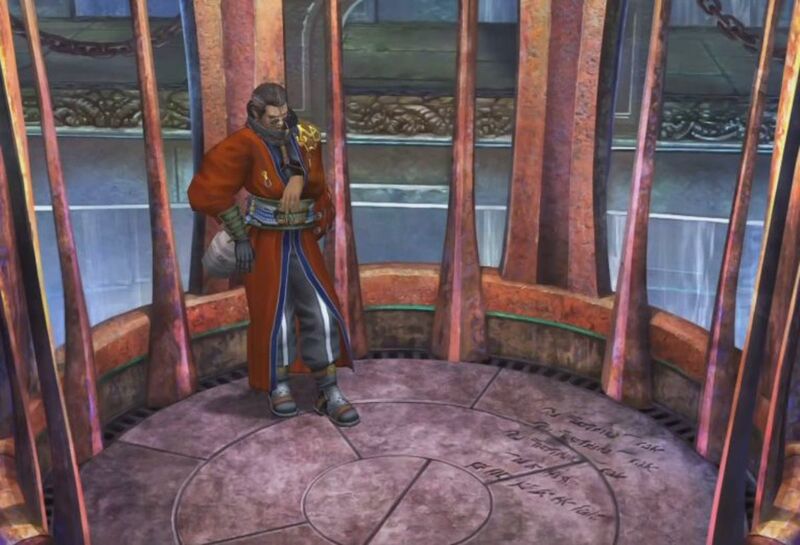 Come on, Auron, PUT DOWN THE CRUMPET and help us. 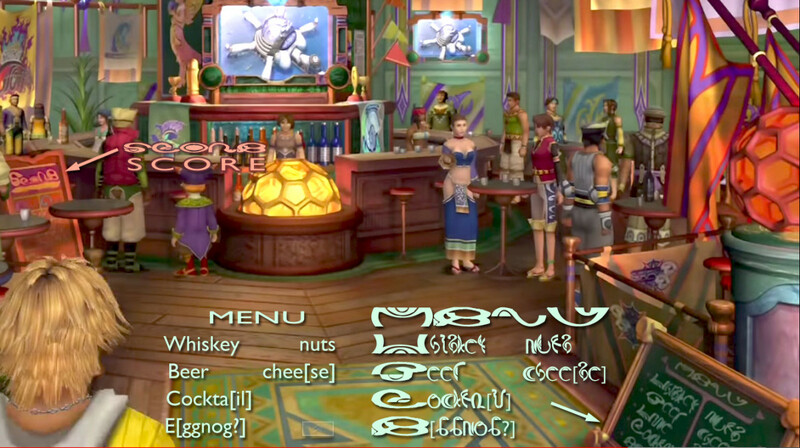 Above: I'm guessing eggnog because Auron's jug is nog, and I can't think of another beverage starting with E. Here as elsewhere around Luca, there's team flags with the names of the teams on them hanging in the background; the Guado glories' flaming purple design is at upper left. Trivia note: that yellow honeycomb-covered sphere in front of the counter was the prototype design for a blitzball (presumably scaled down). Right: Sign partly covered by portly Al Bhed says "BUY" at the top, and "Crazy Fantas[y]" below the jug that the chickabo is popping out of. Right: There's markers like this all along the Mi'ihen Highroad. Below: wall next to the stairs at N. end of Luca, glimpsed during the infamous Laughing Scene. "kand" looks like it should be the end of "Zanarkand," but what comes before it really doesn't look like "Zanar." I'm stumped. Luzzu looks as baffled as I am. I've left Rin's Travel Agencies for the Al Bhed page, but there's a lot of colorful signage along the way to Macalania. Also, sharp eyes will catch the names of at least two towns that never show up in-game! 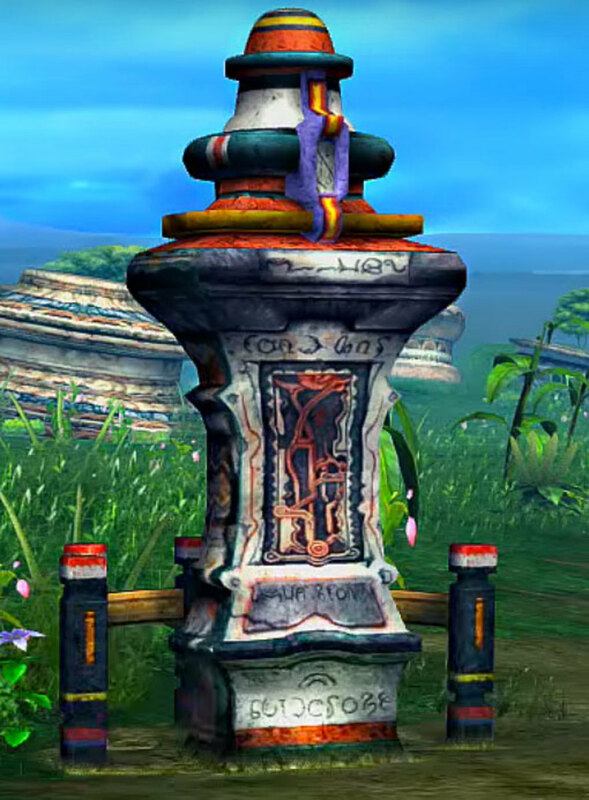 If you look closely, the sign's silhouette is a Shoopuf, and I think there may be a map of the road back to Djose Temple on the tail. 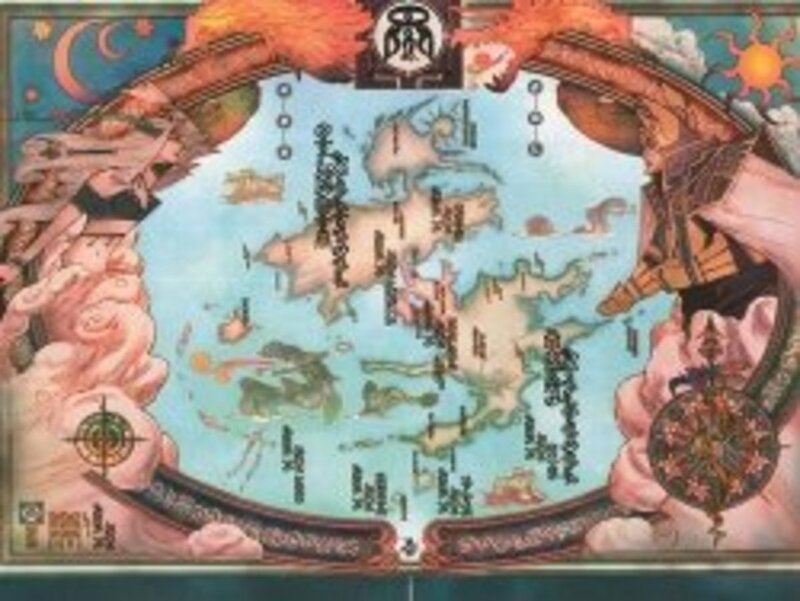 "MAP" is plain enough, but what are these towns labeled "Kino" and "Gonkoga"? 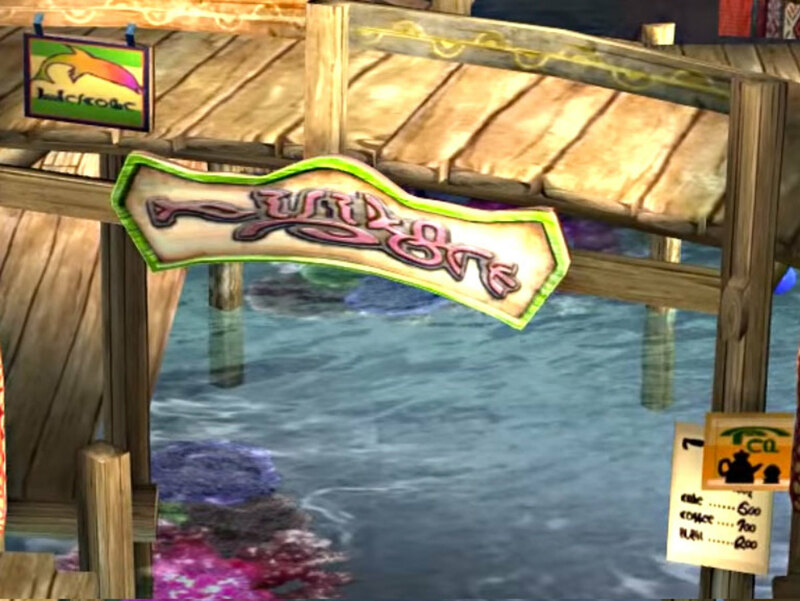 There have actually been a huge number of maps in the background all through the game, on the ferry, in the travel agency, and on marker posts. This is a small piece of a map that was hanging behind the desk in the Travel Agency, which unfortunately was scaled down too small to read. SALE, ITEM and INN signs in Guadosalam. The "Kino" marker is probably pointing to the Mushroom Rock Road area (although it's hard to be sure; it could be pointing towards something back on the Mi'ihen Highroad). 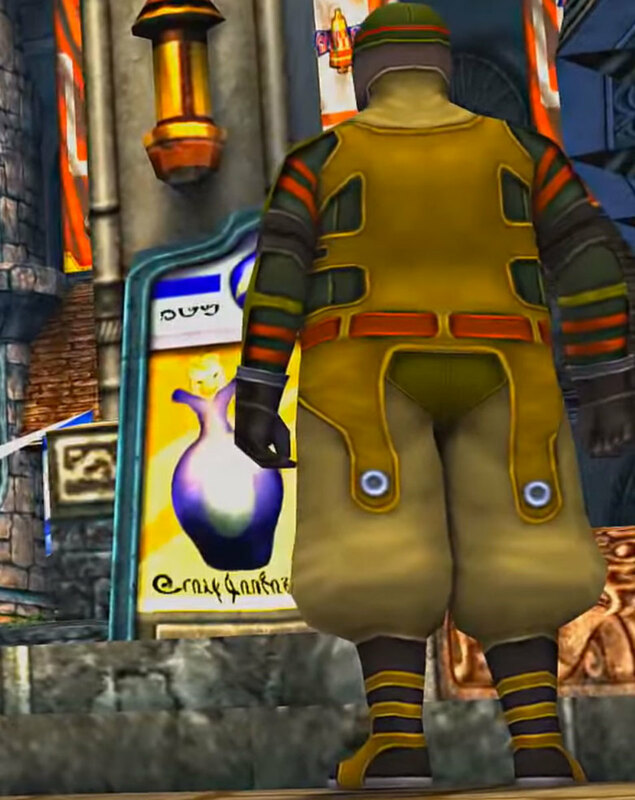 The "Gonkoga" arrow seems to point to the spot that's usually marked "Moonflow" on maps of Spira — I think it may be the north bank where the Shoopuf lets us off. 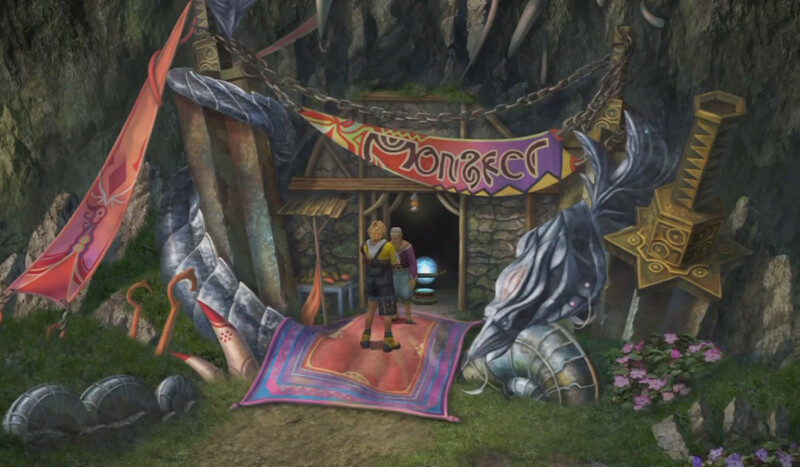 And of course, "Gonkoga" sounds suspiciously like "Gongaga," home of FFVII's Zack Fair! 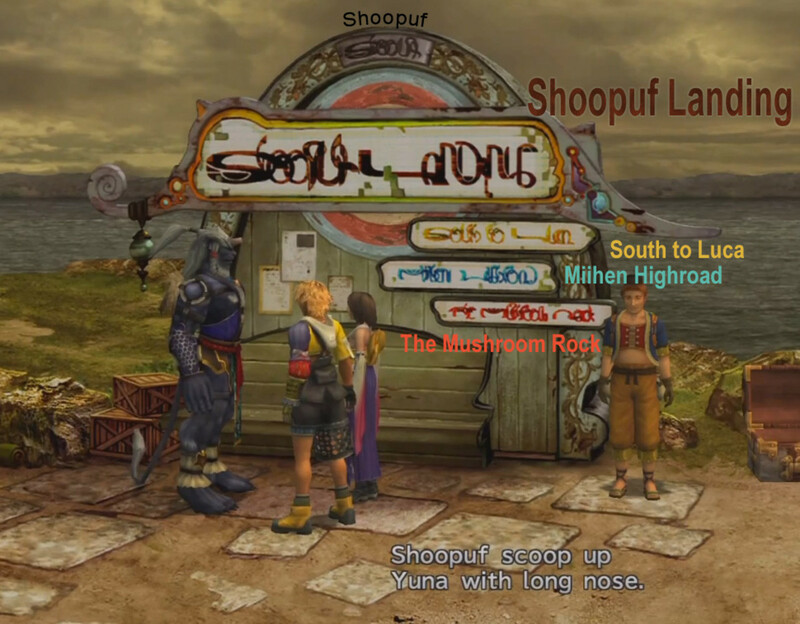 The north shore has a "Shoopuf Landing" sign as well, where a snooty Guado is hiding part of the inscription. 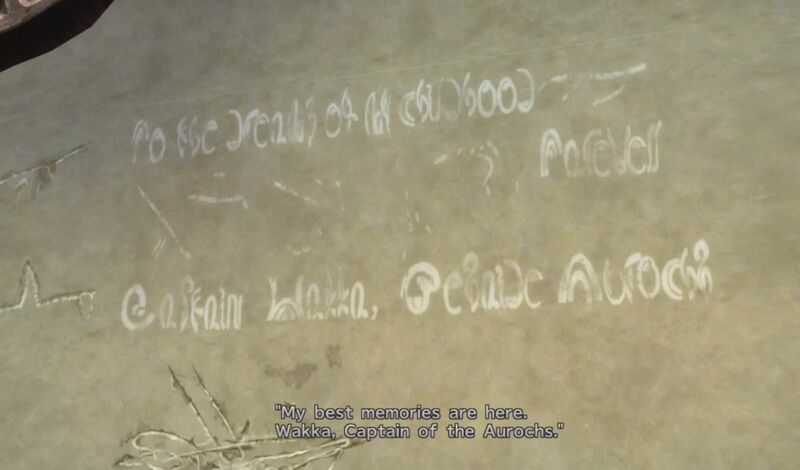 When you played the game, you probably noticed "Lake Macalania" neatly spelled out in capitalized Spiran Script in this flashback. The sign is on an arch just to the left of the Lake Macalania Travel Agency. 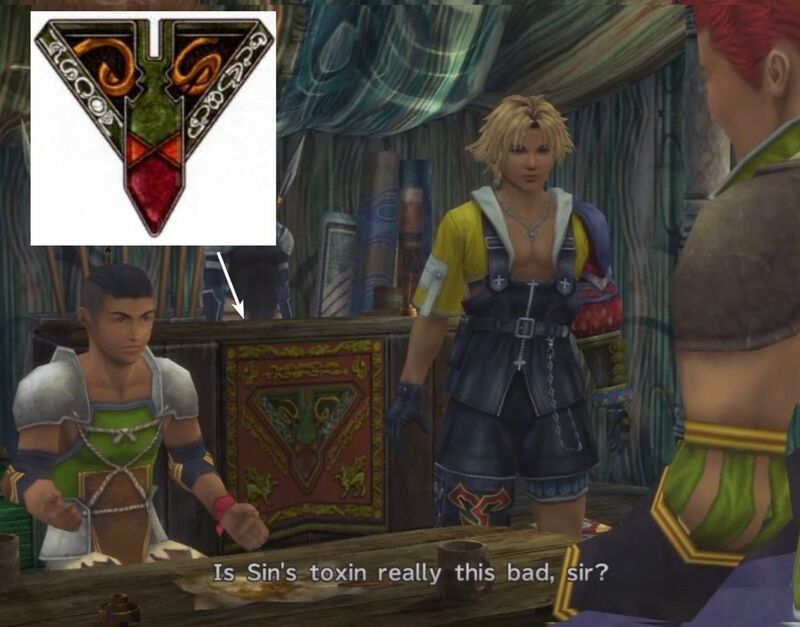 Blast, I was hoping the HD remaster would let us read the floor in the Bevelle jail cell. 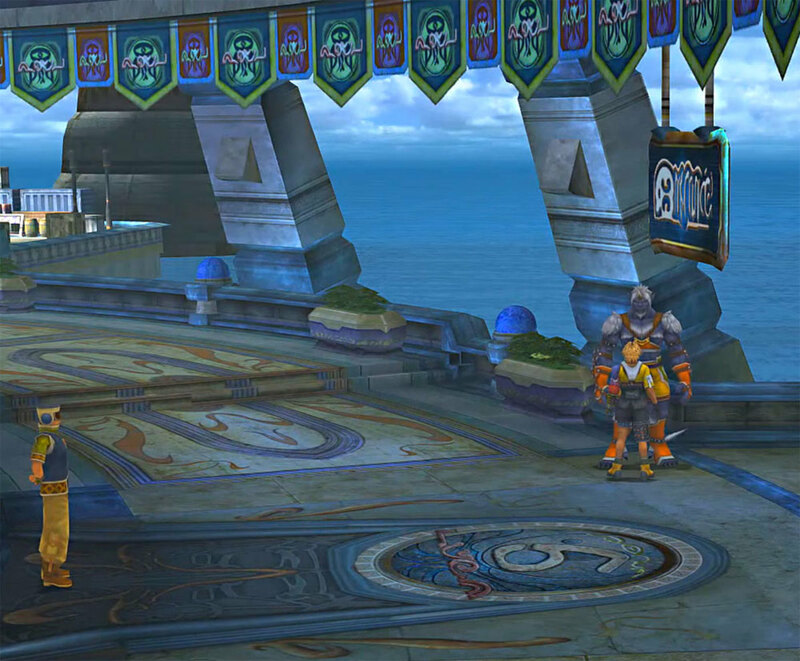 But even after taking a bunch of screencaps with Tidus shifting around, then stacking them to get an unobstructed view of the floor, I still can't read it. 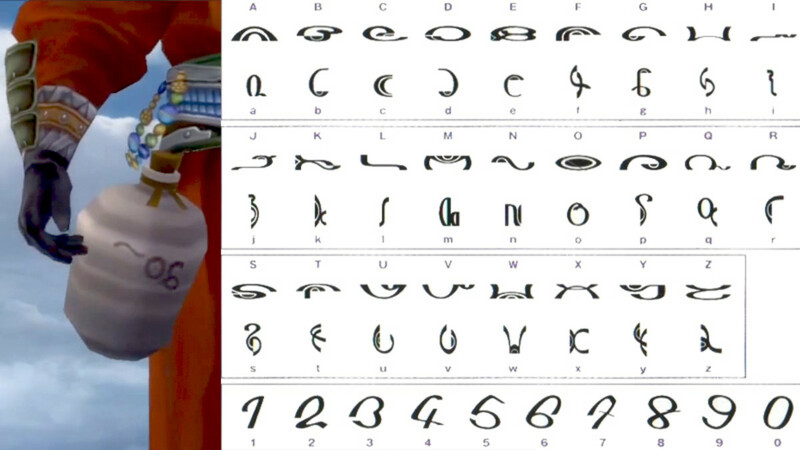 I think it's in Spiran Script, with perhaps "rak" as the final word of the repeated phrase. 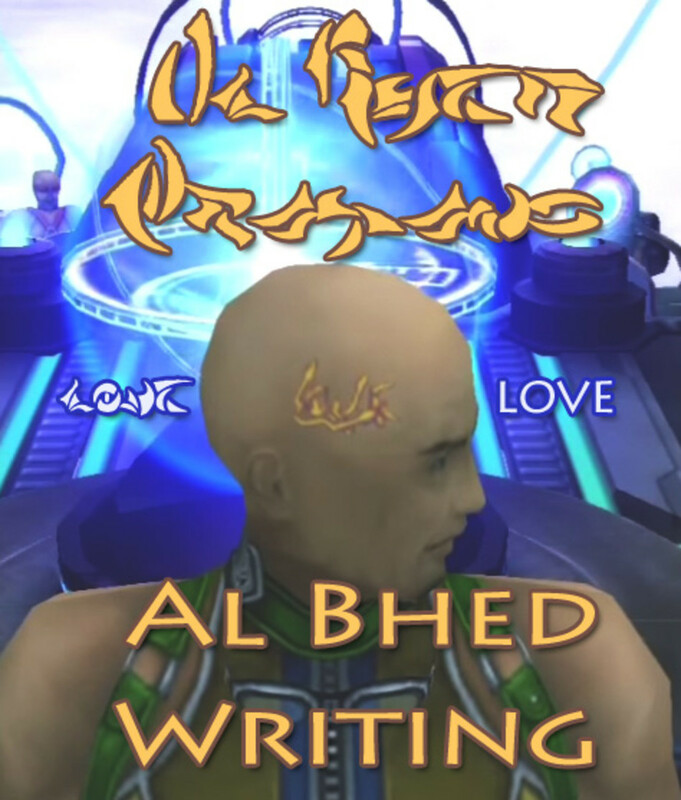 If it's in Al Bhed Script, we're really in trouble, because that's hard to read even in large print. Any ideas? Please leave them in the guestbook below. 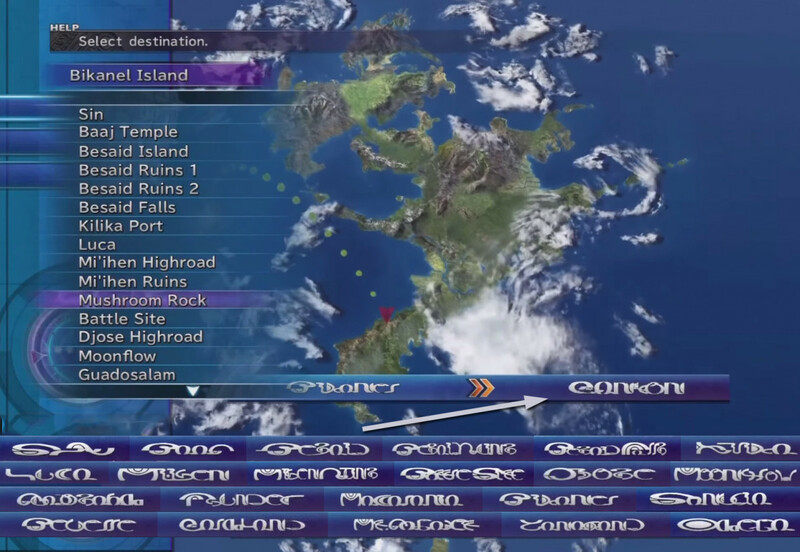 As you scroll down the airship map's locations list, the bottom bar displays the name of your current location and the selected destination. I've screencapped all the different possible destinations and tiled them in strips across the bottom. Most are identical, but there are some minor differences. 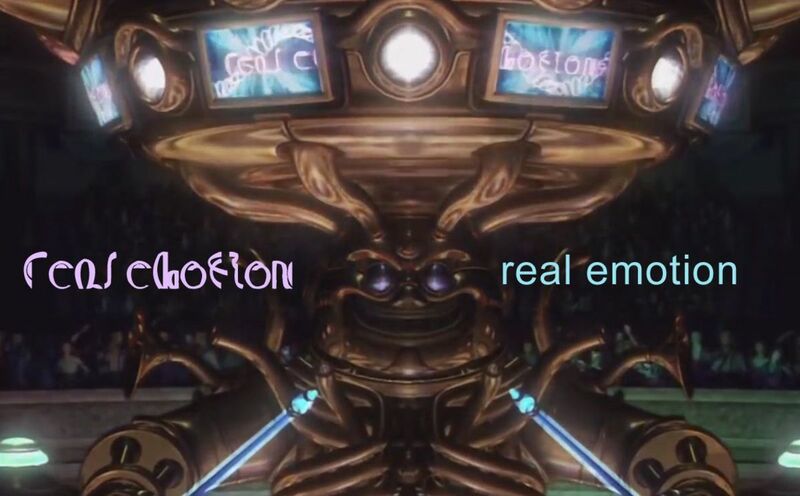 Tumblr user Froakie asked for help translating this one, and we had to put our heads together to decipher it. According to Froakie and Wiredclover, "Ten botsu" are the Japanese words for sky/heaven + death. Which certainly describe what Penance does. Trivia note: Penance's name in several international editions is "Der Richter," German for "judge." The Monster Arena says "Monster" across the top, as you no doubt noticed. "OIL" on the side of this tanker; hitting it causes a large explosion and breaks the bridge. The inscription on the blade says "GUARDIAN." 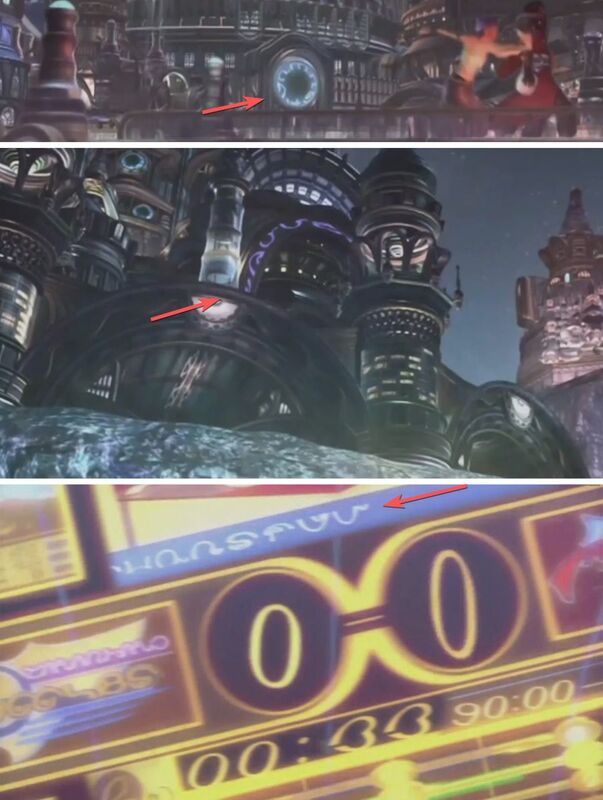 I can't read all of it, but there's a "B" at the top, the left-hand fellow is "CC", the right-hand woman with the glasses is "Judy" (the woman whom Tidus punts out of the sphere pool, or just some random commentator?) 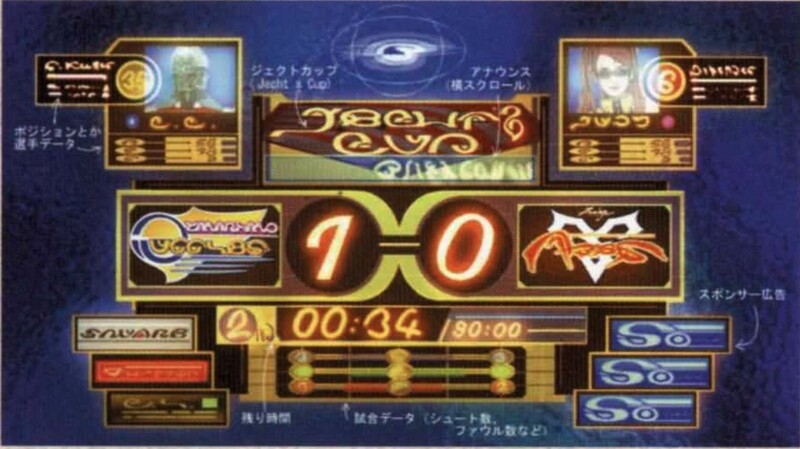 , and the words "Jecht's Cup / Blitzball" between them. "Zanarkand Duggles" is on the left, "Zanarkand Abes" on the right. Below and to the left of the Duggles' logo is "Square"! 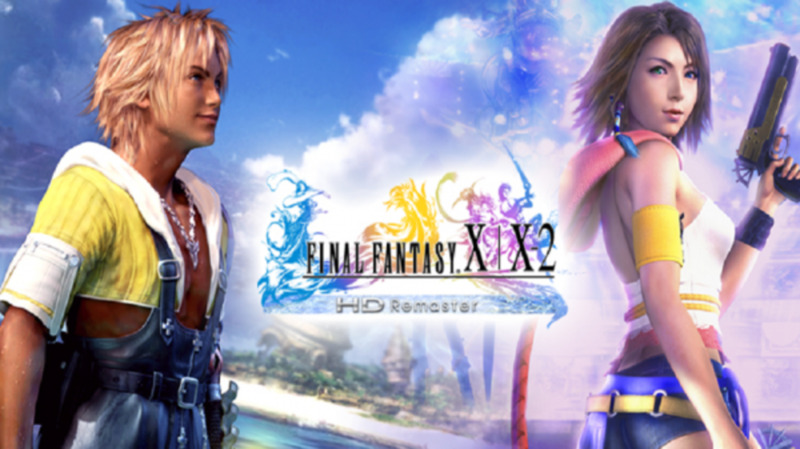 FFX was created by Squaresoft, before it merged with Enix. Decorative Script in Opening FMV? It's rare for Spiran Script to be used decoratively, but Yevon Script and Al Bhed certainly are. 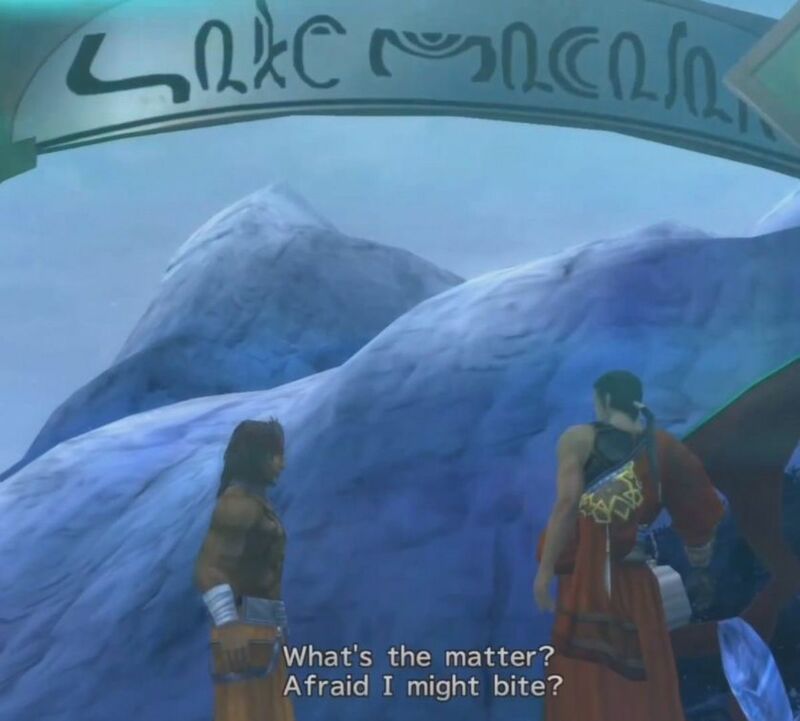 You might guess that the Zanarkand language has changed enough that its words don't translate, but no... FGHQRSTUV is unpronounceable. The words "real emotion" scroll horizontally across the monitors under the stage during the opening FMV. Which it took me forever to notice, since the sight of Yuna turning from demure summoner into J-pop star caused my brain to freeze. 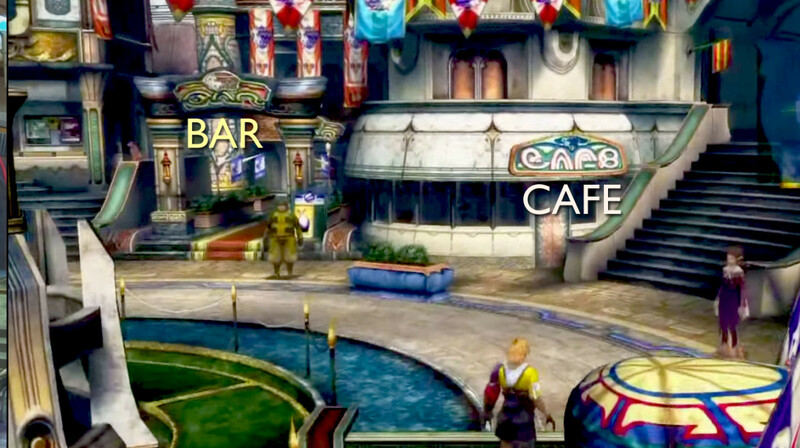 Kilika's added a few new signs after rebuilding: Welcome, Kilika Port, Tea, "cake, coffee, rum(?)" The Gullwings have their names on their Gun Mage outfits, spelled phonetically. 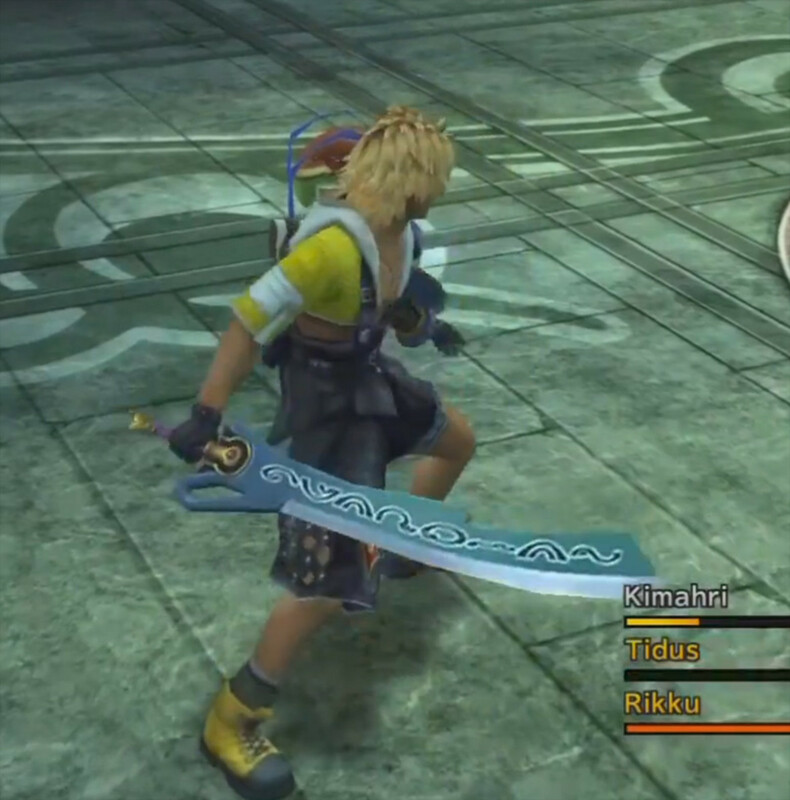 Yes, Rikku is Likku; there's a sound halfway between L and R in several languages. I also double-checked Paine's outfit from other angles; it really does say Pain with no e.
I can't make out any real words on the gun mage's gun (although it might be Al Bhed); can you? in english. So your guess is right. I like your headcanon. There's also an example of it (maybe?) among the signs I can't puzzle out in the Macalania travel agency. I have a clue about the Bevelle floor graffiti! 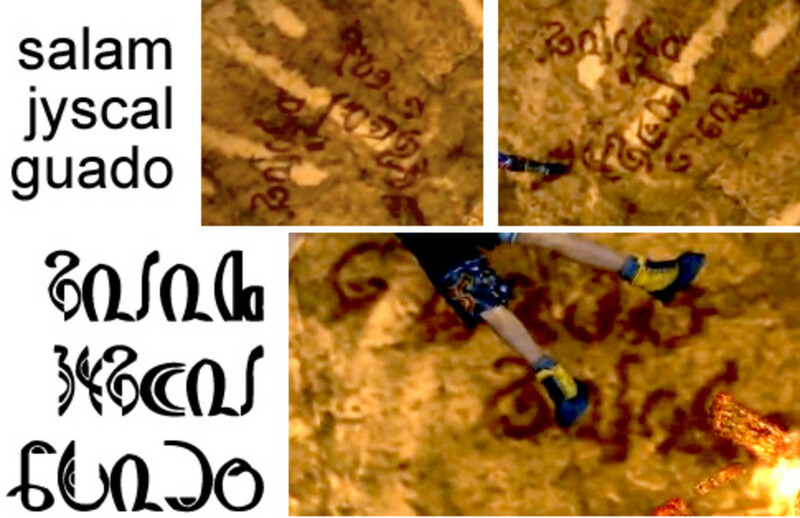 I'm still looking through my LP screencaps to see if I can find it anywhere else, but my hypothesis is that it's a fourth, rarely-used, possibly Guado script. Did anyone translate the text on Penance's chest? Or on the Iron Giants sword? WHOA HEY I was googling to find out what the graffiti was in the jail cell in Bevelle and totally stumbled across this BRILLIANT post. Thanks for throwing this together! Also HI wow I haven't seen you around in years, we were totally lj friends at one point circa 2005. 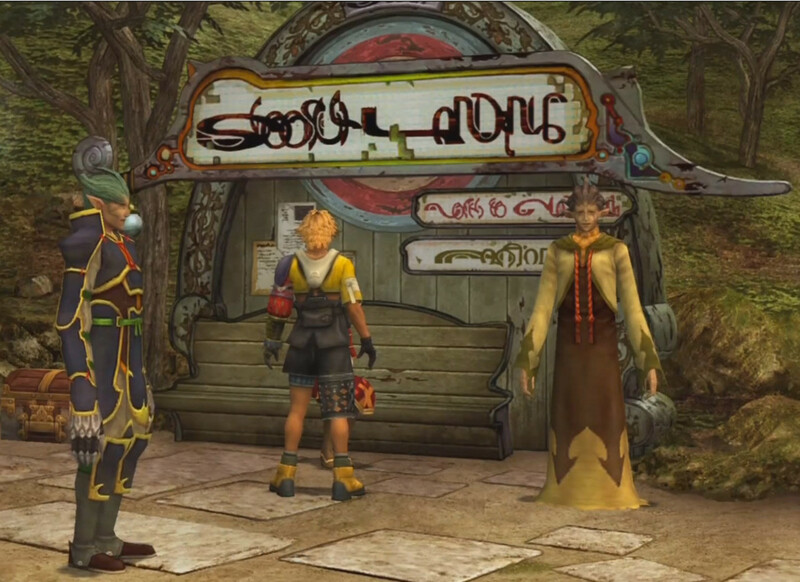 Any ideas what the writing in Tidus' and Auron's cell says in Bevelle? It's amazing how much work you put into this. I'm really impressed by how much you love this game! 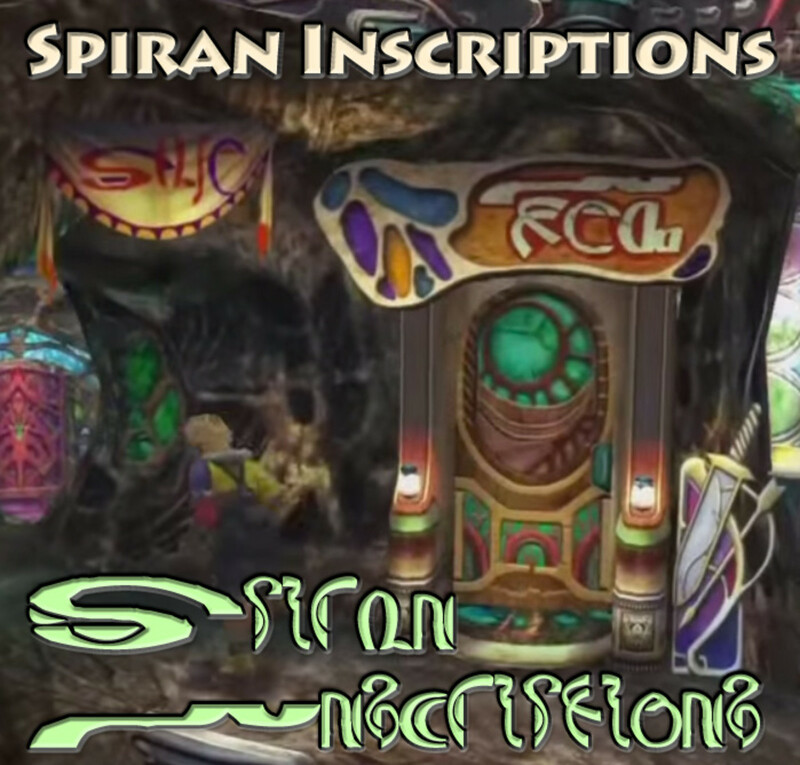 As I read this and noticed how close Spirion Script is to English orthography I wondered why I hadn't figured out the signs before. This was fun to read, I like your voice.